In spite of a few last minute glitches (like him showing up early), we managed to keep Community Citizen Matthew Hackett in the dark until the last minute! Matt’s a great guy and some former students admitted to spending time in his office, but also thanked him for always being fair and respecting them. One of the comments that Matt made was that he was always glad when an angry parent showed up at his door because it meant they cared. When you think about it, that makes sense–and it is equally obvious that Matt cares. 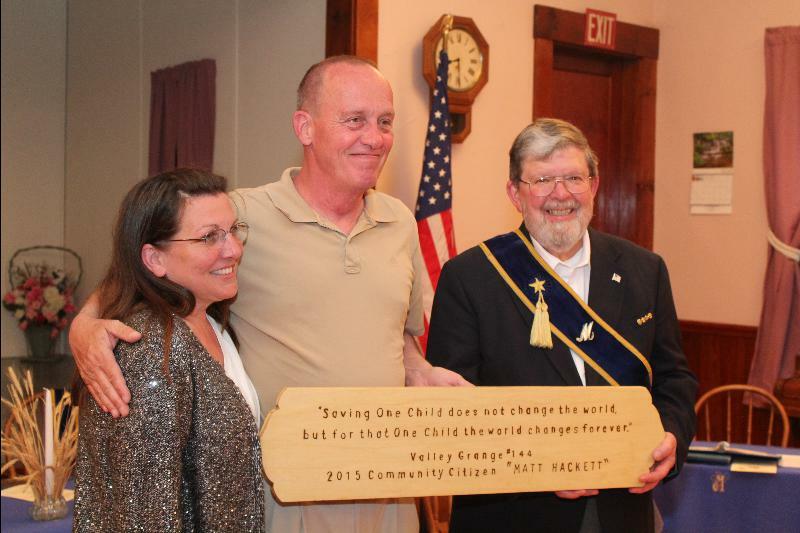 Special thanks to Roger Ricker for making a great wooden sign for the occasion and to Pat Engstrom for her efforts to get Matt and others to the meeting. While we don’t keep an exact count of who sells how many, our top ticket sellers this year include Janice and Pat Engstrom, Roger Ricker, Lois Prescott, and Linda Erwin. Our gross receipts were $658 (including a $50 donation of tickets from Bob Carroll and Linda Erwin) so after deducting the cost of the tickets we net $558. Janice likes to say “that’ll buy quite a few dictionaries.” The raffle winner was Craig Fellows, a farmer from Dexter—he was out cutting wood when we called to tell him of his good fortune. Hopefully he’ll scratch off enough winnings to buy some chain saw oil! Congratulations to long time members… Kevin Annis and Judy Ricker were present for their 25 year awards. Not present but no less honored were Carolyn and Richard Williams at 55 years and Dora Starbird at 75 years.You know there’s got to be some really good stuff about being a Granger–people stay with it!